There is a huge and constant debate in the investment world concerning active versus passive investing. As I am sure most of our readers know, passive investing is simply investing in a series of stock market indexes. Active investing is buying individual stocks and bonds to try to beat the indexes. Standards & Poor's conducts a study of active mutual funds versus the index called The S&P Indices Versus Active Funds (SPIVA) Scorecard (pdf). From this report it is very easy to see that active mutual funds do not stack up well against the indexes, even if 2008 was a better year than most. The image below presents the results from the study. 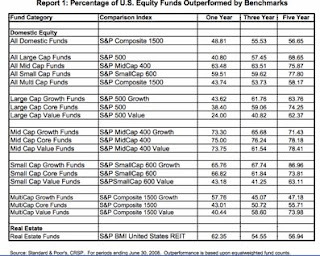 Each number listed is the percentage of actively managed mutual funds that did not manage to beat the index. As you can see, the majority of mutual funds are not able to beat the index. The real challenge for an investor however, is how to know which of the over 2,000 domoestic funds are going to be the one that manages to post better than average performance. The other main takeaway from this information is the fact that investors are paying huge fees to mutual fund companies to support marketing and broker commissions when most of the time these funds cannot even keep up with the indexes. This argument is starting to sound like a broken record, however it is what it is. Mutual funds cannot meet their goals and investors should stop getting ripped off by them. I will get off my soapbox now!